A number of important French homeopathy groups and individuals (health professionals, learned societies, patient associations, homeopathic medicine companies) wish to make the voices of patients heard through an impactful mobilization campaign launched on April 4, 2019. 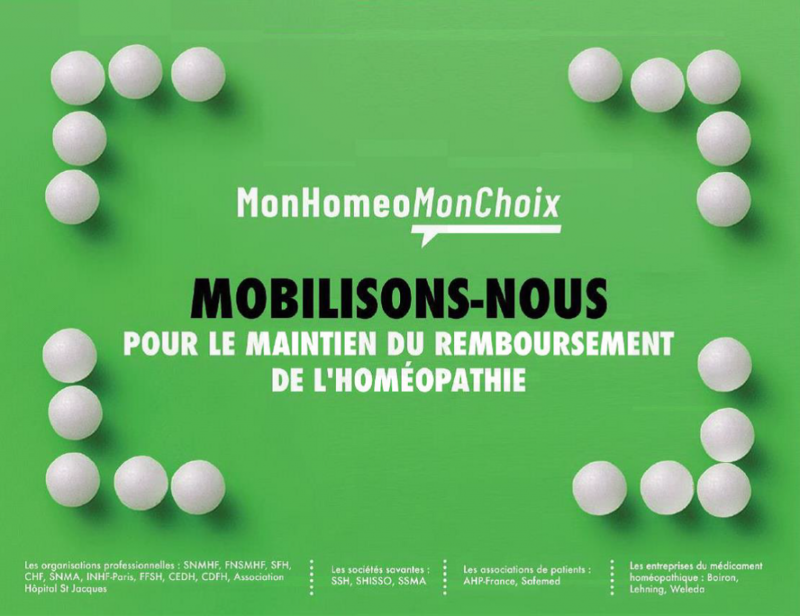 “MonHoméoMonChoix “: “My Homeopathy, my choice” is an information campaign which is mobilization on social networks. The campaign is addressed to all French people who wish to protect their freedom of choice and access to the healthcare of their choice. Homeopathy is currently covered by the French national health services and there is a concerted move to try and stop this. The new campaign aims at mobilising people across social networks to express their support for homeopathy. Charles Bentz, President of the national syndicate of homeopathic doctors is among those who are behind the campaign. “There are millions of French people who take homeopathy and it is the patients who need to speak now”. So far the petition, which only started on the 4th of April, has gathered nearly 50,000 signatures. The campaign is seen as vital because millions of French people take homeopathy and have done so for generations. It is estimated that 3 out of 4 French people have taken homeopathy. Homeopathy is considerably cheaper than other forms of treatment, with the average price of reimbursable homeopathic medicines standing at € 2.70 while the average price of other reimbursable medicines is € 9.90. 1 general practitioner out of 44 and 78% of liberal midwives regularly prescribe homeopathy to their patients; More than 21,000 pharmacies use it daily. 20% of cancer patients use homeopathic medicines to reduce the side effects of cancer treatments. Patients treated by a homeopathic doctor take, on average, 2 times less antibiotics and nonsteroidal anti-inflammatory drugs, and 3 times less psychotropic drugs for an equivalent clinical result. (Statistics taken from the https://www.monhomeomonchoix.fr/ website).